This prestigious residence located on the west side of Yonge Street. along the embankment of the Don Valley, was designed to nestle into the side of the hill at the south-west side of the valley, By so doing. the structure had to be designed to sustain the lateral soil pressures imposed by the 90 feet high slope which continues to rise to the south and west. To sustain these lateral forces a combined system of permanent tie backs to dead men anchors and into the soil along with a tied down 1500 mm thick reinforced concrete raft foundation, located under the central core of the building, was designed and blended into the overall concept. The uplift forces of the foundation raft are resisted with a system of 26 permanent soil anchors with 8 anchors in reserve to be employed if necessary in the future. These special foundation techniques were also combined with reinforced concrete shear walls and core walls which act with the diaphragm action of the reinforced concrete floor slabs to sustain all lateral forces acting on the structure. At the north wing, the floor slabs were terraced to reflect the natural slope of the valley. The expansive cantilevered terraces were achieved by employing post-tensioned systems within the normally reinforced concrete slabs. 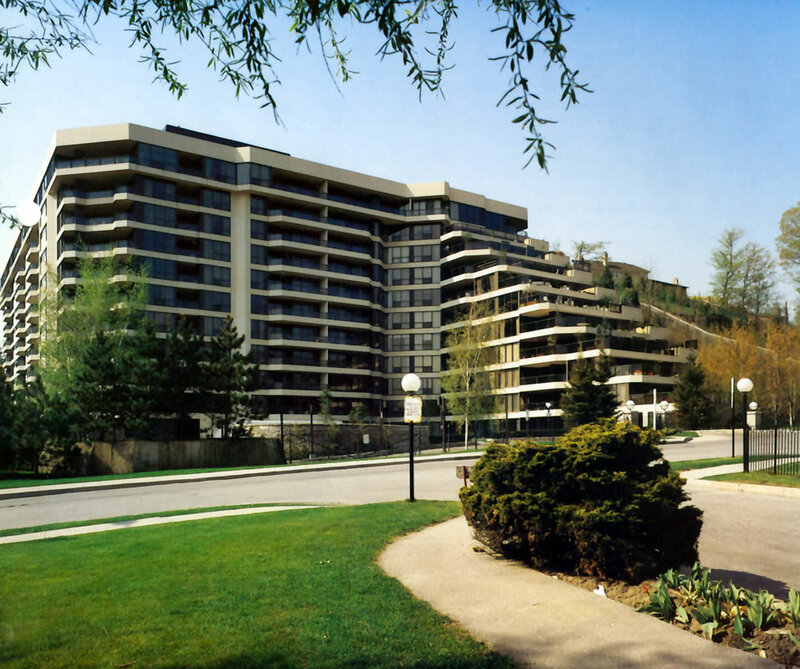 This structure is the only known apartment retaining wall ever constructed in Canada.